Looks fooking lovely in here Wags, are you happy with the soil mix so far? Mine seems to be doing Ok.
Ye man loving the soil dude. I think it's sorted my cal/mag issues. Haven't even used my pH pen this grow. Thank you man . Its a Pain watering after this top Dress tho innit?? water takes an age to filter through. Haha. I'm thinking of going to buy some straw to use as mulch tomorrow. Haha that's what what I said. Winner!! Cheers dude. 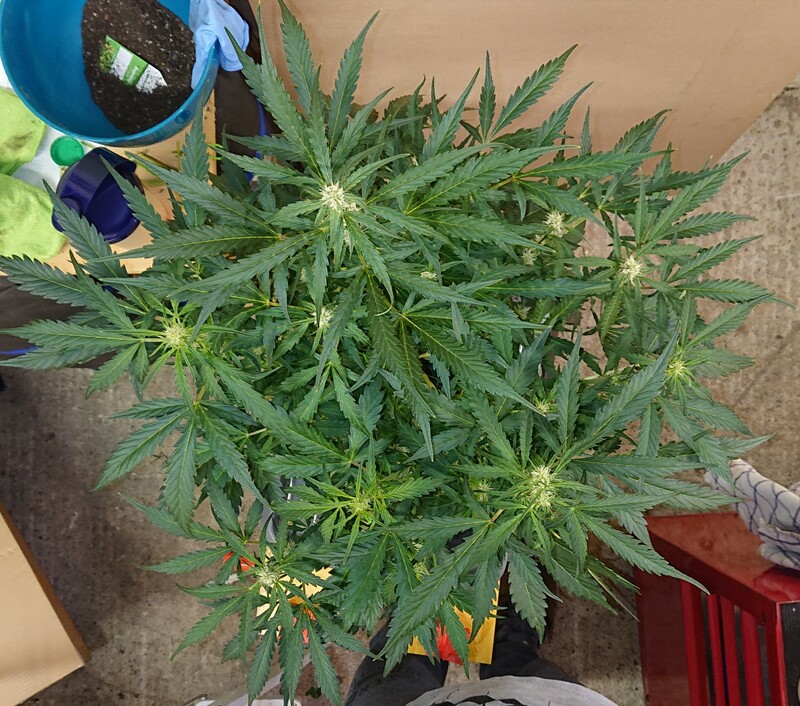 Just do a defol and use the the canna leaves and start a mulch, and just top it up as you go mate lol and yeah the tops dress can be a little hydrophobic, just rake it gently into the top 1cm or 2 of soil but yeah I know what you mean. In comparison to last grow this pic is from day 31 from last grow. I've got zero yellowing anywhere yet. Think today is day 33 above ground. Last edited by Gaz; 13-04-19 at 07:26 PM. Ye tried that man haha I waited got more patience now haha. Ye ill do that with the leaves didn't think of that nice one man. gonna defol leaves tomorrow then lollipop next weekend. Innit man haha. Down to u that pal. And the talk. Yeah great, that way you know you aint bringing bugs in and a good size plant can give a fair bit of mulch material after a lollipop and defol. Last edited by Gaz; 13-04-19 at 07:30 PM. Ah ye thanks to Redz too of course. And to all the talk combined effort haha. Sweet I never thought of using the leaves man. Haha u got a diary going dude?? Last edited by Wags; 13-04-19 at 07:37 PM. Really nice to see it going so well for you Wags. Looks like no PH ing is working well for you! I guess that means my soil is unbalanced. Thanks Man. Only reason I haven't PhD anything or even checked what I'm giving is cos of the soil and ammendments. It's still early days but I'm confident I can get a full green grow rather than a yellow one. Haha. 5 weeks old Today. Both Had a defol, mainly lower leaves and a few upper that were blocking light. 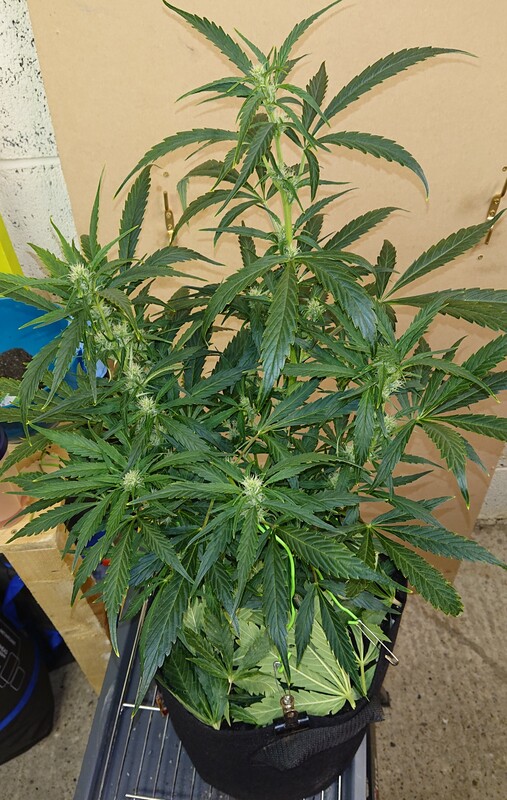 2 or 3 yellowing leaves on the bigger plant but that's it. The bigger one is getting dry quicker. Watering isn't in the schedule today. Gonna have to make some Time later somehow. I realy would not keep those leaves in the pot mate there is a good chance they will form a bacterial fungus. Ah really? Bit of conflicting info going on here haha. If you need a mulch i would use a dry materiel sutch as straw or some landscape fabric cut to shape and placed on top of the soil. There will always be with these things mate, and I wouldnt just ignore it mate. Read up and make your own choice based on what you read. I wouldnt want responsibility for you having problems mate. Last edited by Gaz; 16-04-19 at 05:24 AM. Haha OK cheers boys. I'll leave them. On for now till I get some landscape fabric, which sounds better than straw. Thanks again dudes.